Apogee has announced new plug-ins and new DSP Recording Workflow for Ensemble and Element Thunderbolt Audio Interfaces, their all-new DualPath FX Rack software that they will be previewing at NAMM 2018. The DualPath FX Rack software has been designed specifically for the Apogee Ensemble Thunderbolt and Element Series audio interfaces. DualPath FX rack will provide dynamics and EQ plug-in processing that runs both natively in your DAW, like Pro Tools or Studio One, and on hardware-based DSP in your Apogee interface, with the ability to launch both plug-in types from your DAW and link them for parallel operation. When you don’t have an Ensemble or Element Series connected, DualPath FX Rack plug-ins will still continue to run natively on your computer, no hardware audio interface required so that you may seamlessly move your sessions between people, places and workstations. 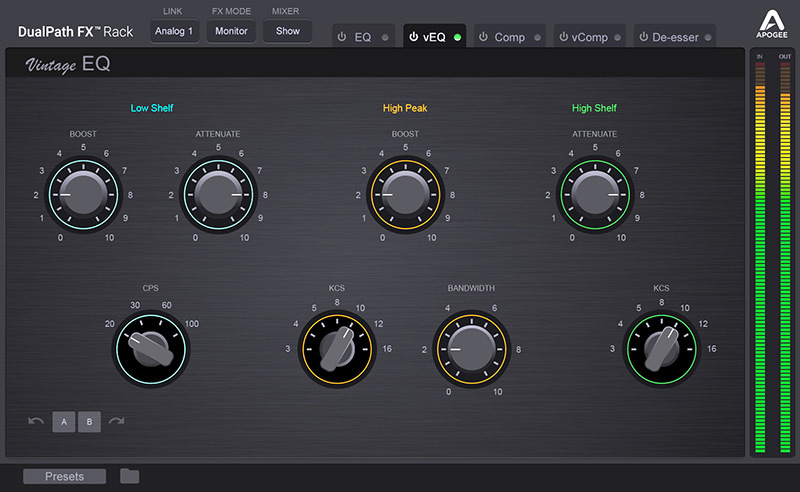 Run DualPath FX plugins completely from your DAW - no need to switch between apps. All DualPath FX settings are stored and recalled within your DAW session. DualPath FX plugins remain active on playback even if Apogee hardware isn’t connected. Apogee are at Booth #17901 (Level 2, ACC North). For a more in-depth demo, register for AES@NAMM's Pro Sound Symposium. Apogee will be presenting at the Anaheim Hilton, Studio Academy C @ The Redondo Room (Level 4).